One of the benefits of dry needling is it's a very precise way of releasing a muscle. Compared to massage, getting a twitch response out of a muscle gives a very predictable and effective release, deep from within the muscle belly. In this post, I wanted to give you some insight into some of the best responding muscles that dry needling can help with. If you want to learn more about exactly how dry needling works, please read more here. Of course dry needling can be done to any muscle. The following post is to give you some insight into some commonly treated muscles that give especially good 'bang for your buck'. *Please also see some important notes at the end of the post. In terms of shoulder pain, the deltoid is a very under-rated muscle. The deltoids include three sections (anterior, middle and posterior) that sit superficially around the shoulder. The deltoid is involved in almost all shoulder movement. The way the it wraps around the shoulder makes it a very difficult muscle to stretch and it is prone to building up tension. 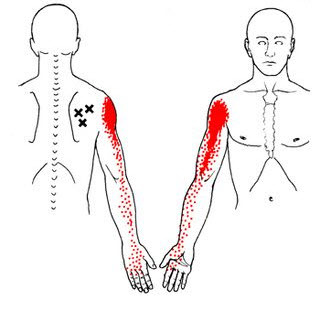 Trigger points and knots often develop in the deltoid that can give rise to shoulder pain (see pic above). This pain can be quite severe and unrelenting and stubborn to usual treatment. A common history is over-doing some push-ups and waking up the next day with pain in the front of the shoulder. Or someone who has done a lot of heavy over-head weights (Cross fitters...!) over the years and doesn't do much stretching. Sometimes it's the last small movement and final straw the breaks the camels back so to speak. Dry needling the deltoid often gets some powerful twitch responses. Expect soreness and a dead arm feeling for a few days before things settle down. The latissimus dorsi is a fascinating muscle. It has attachments to the hip, shoulder, upper back, lower back and rib cage - and that makes it the largest muscle in the upper body. Tightness in the latissimus dorsi has been shown to be an important cause of chronic shoulder pain and chronic back (especially upper back) pain. Because of its extensive attachments, it can be another difficult muscle to stretch effectively. Dry needling gets in there and gets the job done. If your lats are tight, you will need to add in some regular childs pose and over-head stretching, in addition to foam rolling your upper back. The fastest way to release your ITB ? 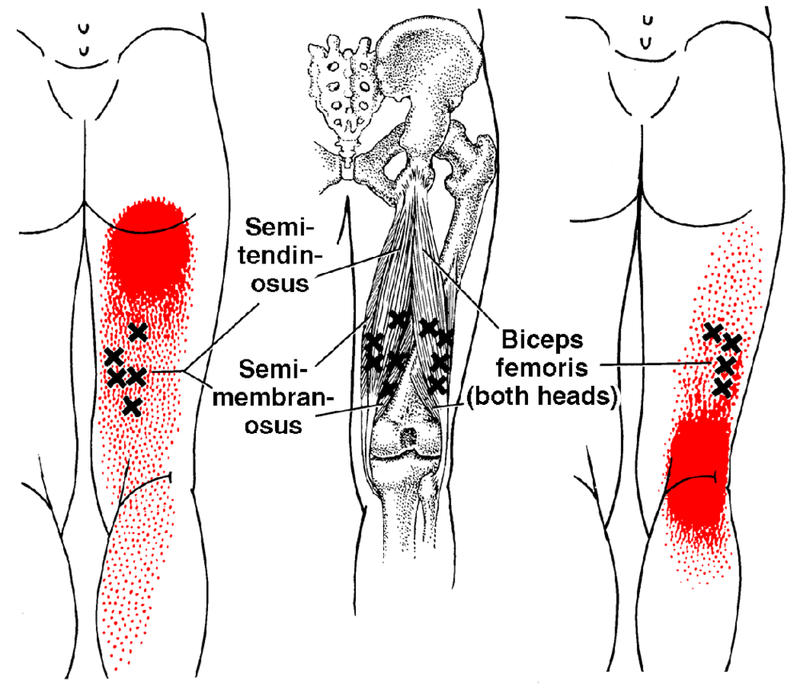 Release the under-rated small muscle that attaches to it, called the Tensor Fascia Latae (TFL). The TFL is a small but powerful hip flexor and usually tight from excessively sitting, walking, running and cycling. When overly tight, can contribute to knee pain by causing mis-tracking of the kneecap. Combine dry needling with some specific gluteal activation and you will be well and truly on the way to saying goodbye to your ITB pain and tightness. One of the cool things about dry needling is that we can access deep points in a muscle that you would otherwise be unable to access. The gluteus medius is an interesting muscle that can be dysfunctional in chronic lower back pain, hip pain and knee pain. Dry needling can immediately 're-set' the glutes and allow for a graduated re-loading program. Long-term, a well functioning gluteus medius will protect your hips, knees, ankles and lower back. 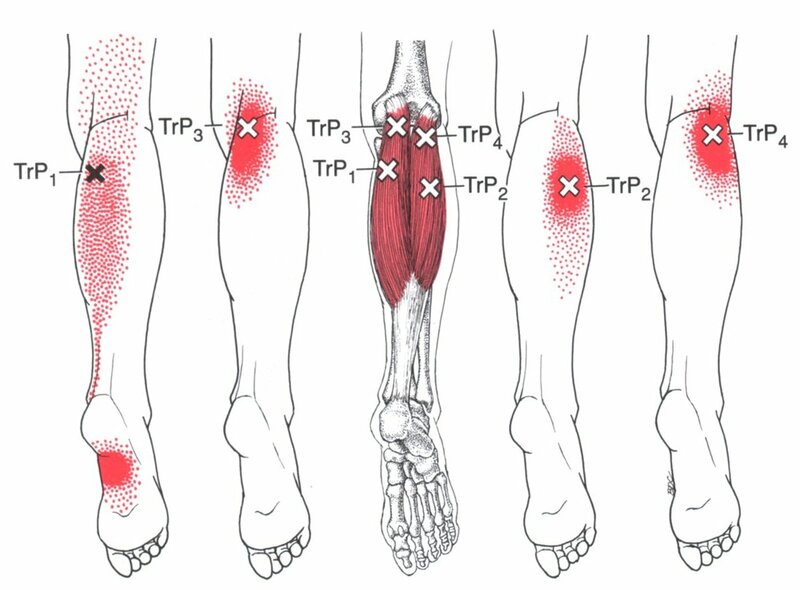 Calf muscle tension and limited flexibility is especially common in the modern age. When tight, the calf muscles are prone to cramping and eventually tearing. Deep tissue massage can be effective, but can be very painful, bordering on intolerable. Dry needling to the calf muscles, whilst intense, is quicker and more effective in its release. Expect some treatment soreness for 1-2 days post-needling. And don't forget to re-build your calf capacity with an appropriate strengthening program. Much like the calf above, the upper traps can be loaded with tightness. Causes can include poor posture, lack of physical activity and prolonged stress. Heavy handed massage can stir up more irritation in the muscle. Dry needling is more like using a sniper approach - with a few direct releases, you can release the traps and get the blood flowing much more effectively and deeply. This study recommended dry needling for immediate pain reduction in upper body myofascial trigger point dysfunction. Using heat on the traps via a wheat pack is really helpful, especially in the evening before bed. 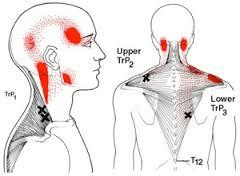 Also make sure you are getting enough down time as chronic upper traps tension is a sign of sympathetic over-activity. The infraspinatus is a sneaky little muscle that sits behind your shoulder blade. It is often weak and gets overloaded when using your arm and shoulder. When the infraspinatus gets tight, you'll often feel pain in the front and deep part of your shoulder. Dry needling de-activates the trigger points quickly, but be prepared for a dead arm for a few hours. Don't forget to re-build with some simple strengthening exercises with a thera-band. Tennis elbow is a very common condition that primarily affects the extensor tendons on the outside of the forearm. The pain often drags on for months and years due to a very poor blood supply in the elbow tendons. The research shows that dry needling releases a very specific chemical, known as Platelet-Derived Growth Factor (PDGF), that produces a strong increase in blood flow into the muscle. In effect, blood is a healing agent, bringing oxygen and critical healing chemicals to the damaged cells. No other technique that I know of is capable of doing this. When was the last time you stretched your bicep muscle? Another muscle that gets used a lot, and builds up a great deal of tension. You'd be surprised how that niggling pain in the front of your shoulder improves after your biceps is released through dry needling. Tight hamstrings are pretty common. Stretching them normally does more harm than good (see here). Dry needling produces a quick and effective release. Specific strengthening exercises that lengthen the muscle gives the best long term solution. Dry needling certainly isn't for everyone, but it can be a very effective and powerful treatment in the right context. 1. There are different types of dry needling and this blog refers to the type that activates a local twitch response. This is very different to acupuncture and dry needling where the needles are inserted superficially and left in for 20 minutes as the practitioner leaves the room. 2. Dry needling is always used as part of comprehensive treatment approach. This includes assessing your thoughts and beliefs about your injury, movement patterning and general health considerations. Specific exercises targeted towards your individual needs will help give you the best long-term outcome. If you have any questions about dry needling - please feel free to give us a call 1300 657 813. Swimming is without doubt one of the best things you can do for your body. Water has a natural buoyancy that decompresses the joints and enables smooth, pain-free movement. Swimming also improves core strength and is one of the safest ways to maintain your cardiovascular fitness. However, that doesn’t mean it’s perfect. Like any other physical activity, repeated movement patterns over time can lead to muscle imbalances. As a Physiotherapist working with swimmers, the most common area I see problems are in the neck, shoulders and upper back. In the clinic, I find myself repeating the same set of exercises to my patients, so I thought I’d write this blog post to share with you in the hope you can avoid future issues. The majority of swimming injuries are from overuse, relating to a gradual tightness that builds up over the years. Once the muscles have developed significant restrictions in flexibility, pressure starts to build in the spine and shoulder joint. If you are consistent with your stretches and a few simple exercises, you can counter-act the typical muscle imbalances and stay pain-free in the water. The foam roller is without doubt the best way to maintain your tissue quality, improve flexibility and maintain your muscle balance. Consistency is the key and the best time to do these exercises is straight after you swim. Lift your hips up and keep your head supported with your hands. Roll the upper part of your back from the shoulder blades down to the lower ribs. Keep breathing and relax your jaw. You should feel some nice releases in the joints here. Avoid the neck and the lower back. Drop your hips to the mat and arch the middle of the back over the roller. Breathe in through the nose as you expand the diaphragm for three breaths. Repeat at a few different levels, depending on where you feel tight. Lie on your side and roll up and down along the outer part of your shoulder blade. If you feel a sensitive spot, breathe and hold the pressure for around 30-60 seconds until the trigger point releases. While resting your shoulder on the roller, gently rotate your body forwards and backwards, searching for any tender trigger points. Take care not compress any nerves around the shoulder - you shouldn’t feel any pins and needles or significant pain. Place the roller parallel to your left side. Place the right arm on the roller and reach through to the left, aiming to feel a gentle stretch between the should blades. Rest your head gently on the mat. As you exhale, reach a little further to the left. Aim for 30 seconds and then switch sides. Sit your hips back towards your ankles with your arms on the roller. Breathe in through the nose and expand the lower ribs. As you breathe out, gently sit the hips back further and lengthen the arms away. You should feel a nice stretch though the back of the shoulders and lower back. Try 30 seconds straight ahead and then 30 seconds on each side. To stretch the left side. push the hips back to the left with the arms on the right side of the foam roller. Lift into a plank with your forearms on the roller. Breathe through your diaphragm and hold for 30 seconds. Advanced: gently move roller up and down using the arms, for more intensity. Bring your awareness to your neutral spine. You should have a slight arch in your lower back (about 1 fingers width). Maintain this position while you breath in and slowly bring your arms out to the side and up over your head, feeling a gentle stretch in the front of the shoulders. As you breathe out, lower the arms down, whilst maintaining neutral spine. Arch your upper back and look down towards your hips while contracting your abdominals. Then reverse the motion by lifting your head and hips. Repeat 10 times. Note: Take care not to overstrain your neck or your lower back with this exercise. Do not force into the end of its range. Use the foam roller to bring some more intensity to the tricep dip. This exercise will help develop resilience in the shoulder stabilisers. Take care not to do too much too soon. Lie on your side and push into a side-plank, either through your knees or feet. Keep breathing while holding for 15-30 seconds. Then repeat on the other side. Keep the shoulders, hips and knees in the same alignment. This exercise will help strengthen the small stabiliser muscles in the shoulders.